As near as I can tell, they do something similar (presumably using cheaper methods) with many fragrances notes, which is why notes you used to hate — patchouli! — don't bother you anymore, and why smelling materials in their natural state is no longer necessarily helpful to the budding perfumista. But back to the case in point: I only bring all this up because what I imagine they did for Jersey (and of course, it goes without saying that I have no idea what they really did) is that perfumer Jacques Polge over at Chanel had his lab people slice natural lavender into 50 distinct groups of molecules, and then discard 10, so that it was even cleaner still, and reassemble it. And then he decided he liked it pretty much as it was, and so he just added a very pale and sheer vanilla (laundry) musk. And voilà! it was done. Does that sound good to you? If so, you'll probably like it, and you should go smell it. It does not smell so happy to me, in fact, it smells like a not very wonderful household product of some sort, vaguely scented with lavender. The Non-Blonde suggests Downy® Simple Pleasures® Lavender Serenity Liquid fabric softener, but I'm afraid she is being too kind. With the usual apologies to any fans (and I have seen nice comments, so there are most certainly people who like it) it is easily my least favorite of the Les Exclusifs — and that is saying a lot, since I'd just as soon never smell Coromandel again, although for very different reasons. Do tell us your favorite lavender product (of any kind) in the comments! Chanel Jersey is available in 75 or 200 ml Eau de Toilette. Note: top image is lavender [cropped] by wsmith at flickr; some rights reserved. Ugh! Your review does not bode well for me liking this product, lol! I’ll smell and test it anyway. Do give it a shot, why not? Maybe you’ll love it. It does not sound very eciting! My favorite lavanders are the twins Jicky and Mouchoir de Monsieur. I love the smell of lavander, and I own several scented body products featuring the note. I’ve been less lucky with fine fragrances. Except for Lutens’ Gris Clair and Encens et Lavande, it seems every niche house features their own version of Caron’s clean lavander and vanilla pairing. I already have my issues with too much vanilla, especially when too clean, but I find the classic pairing with lavender particularly hideous. So I can safely cross Jersey off the wonderful Les Exclusifs list! I really don’t love lavender, and don’t know why I love Jicky. And it took me awhile to warm up to Brin de Reglisse, but now I do adore it. Favorite lavender product of any kind? My homemade peach, lemon zest and lavender cordial. If this was a scent, I’d bathe in it. Oh, that does sound wonderful. Recipe? ok, then my favorite lavender treat is my trademark crème brûlée à la lavande. I also love lavender honey, has anyone tried it? It is almondy and not too sweet. I’d love a perfume like that! Really, lavender creme de brulee? That sounds wonderful. We need a recipe poll. agree with you Zazie , I’ve had crème brûlée with lavender, scrumptious (but then, crème brûlée is one of the best desserts anyway), the honey is also good, I have a nice rice-pudding recipe with lavender both as honey and syrup. Odour-wise: lavender fields in the Provence can’t be topped, otherwise lavender is one of my no-goes,perfume-wise, and I guess that Jersey is not going to make me change my mind. The most popular of my preserves when I give them as gifts is a lavender peach jam. I make a really strong lavender “tea” and use it to flavor the peach preserves–it’s like summer on toast! As for lavender scents, my only current love is Gris Clair. I keep feeling like I’m missing something in Jicky, but it just doesn’t do it for me, yet. However, my favourite lavener is the Hypnose pour Homme Lancome: I think lavender and amber is quite a combination. Anyone tried the Jo Malone Amber and Lavender? I’m not a lavender fan at all. I have always shied away from products containing lavender, until recently when I discovered Andy Tauer’s Reverie au Jardin. That stuff, I could huff for hours. This seems like a very ‘safe’ entry in the LE. LOL at “huff for hours”! Chiming in for Reverie au Jardin, my favorite lavender fragrance! Well, when it comes to lavender you can love it or you can hate it, it’s probaby not possible to like it a little or so. i also like Original Source lavender liquid soap, they also have a bubble bath in lavender which I didn’t try. And what the heck, dried lavender flowers are awesome, bought a whole bunch to decorate and lavender-up my room. Ah, the Caron is wonderful — I should have included that on my list too. Caron is 4 times older than I am, but thanks to some other fragrance-liking-noses from NST I found out about it, bought it as cheap as possible (19 dollars) and really love it. Lavender so fresh, vanilla so warm and cozy. I’ll vote for Caron Pour un Homme, too. Very nicely done. I don’t really need anymore lavender. I like Pour un Homme, but something in it is very harsh on me. By Kilian A Taste of Heaven is very similar, but without the harshness. I also like Gris Clair a lot. It is probably my favorite lavender. Urgh, I’m yet to sniff it and I’m already feeling disappointed. Some of my Absolute Favourite Perfumes Ever are from the Les Exclusifs line up, so it’s a shame to see that Chanel are seemingly letting the standards slip (while still charging the hefty prices). I love lavender and one of my favourite lavender products is Origins Calm To Your Sense Lavender and Vanilla oil for bath & body. Really nice in its own right and vaguely reminds me of Jicky because of that scent combination. I hesitate to ascribe to “letting the standards slip” — I do not think this is a good fragrance, but it is not hardly the first Chanel I have ever thought was not a good fragrance. Of COURSE that does not mean you can’t feel that way, just want to be clear about what I mean! I think that I feel that way because – rightly or wrongly – I tend to have higher expectations for Les Exclusifs and it feels like we haven’t had a good LE since Sycomore. I’d probably be less grumpy if the most recent couple of releases were a part of the main line. Plus they stopped doing those wonderful 4ml miniatures which counted for LE samples and have switched to the very standard carded 2ml samples about a year ago. I’m sure that alone saved them a pile of cash and – while I’d love to believe that they invested it into those new iris fields – I worry that they are simply putting less care into the LE line. I do appreciate the smaller bottles though! Oh, I agree — there should be a higher standard for the Exclusifs. But Chanel has kept their niche line more middle-of-the-road than other luxury brands — they haven’t gone for wild bursts of creativity, if you know what I mean. This one, I think, is just a bomb, in the same way that anyone can make a bomb — I don’t think it’s necessarily a sign that they’re doing anything different or putting less care into the line. I don’t really like lavender in perfume. But I find the scent calming, so occasionally use a lavender “pillow spray” when I am having trouble sleeping. For some reason I have never found it calming, don’t know why! @Robin, have you ever tried some mint fragrance for calming/sleeping? I believe you! I haven’t tried it though. I do find sandalwood & jasmine work very nicely to relax me at night, although more & more I find I appreciate having no scent at all when I go to sleep. I’v disliked all the ordinary lavender body products I’v tried, but I do remember Gris Claire being strangely pleasant. Actually after smelling it a few times, more ordinary lavender-soap scents stopped being quite so offensive. Maybe Gris Claire is a gateway drug to lavender, like Infusion d’ Iris is a gateway to Iris! See, I love the scent of lavender (I have English lavender growing like a weed in my herb garden) but I can’t stand Gris Clair – the smoky note overwhelms the lavender. I actually use that lavender Downy despite the fact that it smells nothing like lavender. Trader Joe’s makes a lovely lavender handsoap. As for lavender based perfumes I’ll put in another vote for Reverie au Jardin. Very true, Merlin. I can’t abide the smell of lavender, so it’s absolutely not calming to me. And unfortunately for me, when people find out I’m interested in perfume, they immediately think that I must therefore love lavender (why?). I’ve received as gifts and have given away more lavender body products than I can count. Yeah, maybe it is just not liking it! It seems to wake me up. Lavender is one of those notes I love in “real life” but have problems with in perfume (hmm, poll idea? I’d put fennel/anise/licorice and tuberose in that category as well). I do like SL Gris Clair in teeny tiny doses, although Encens et Lavande conjures to me a little bar of deodorant soap you’d find in the shower of the Bates Motel. For a cheap lavender thrill, Dr. Bronner’s lavender soap is quite nice. And will add that most of the Bronner’s soaps are good cheap thrills. I’m not a big almond fan but I love the almond one. Have you ever tried any of Indigo Wild’s goatmilk soaps? They’re not particularly cheap (but not spendy either) but they have some great lavendar combos, like lavender-anise, lavender-rosemary, lavender-mint, uh….lavender-frankincense (I think) and a lemon lavender…and I’m probably forgetting a few. And they’re always doing new stuff too. Encens et Lavande is calm in a bottle to me. I hoard my decants and use it after particularly trying days. Gris Clair is my second favorite lavender scent; I love the way it morphs and changes all day on my skin. I have to be in the mood for it though – for either one, in fact. 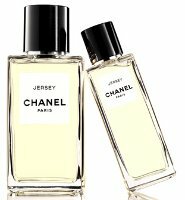 I generally adore most Chanel scents but Jersey hasn’t thrilled me from the first time I read about it, and your review makes me even less excited. I will definitely try it the first opportunity I have, though. Oh, do try it — who knows. I like lavender that smells like lavender. When they sweeten it up too much I don’t like it. I have a lot of lavender in my flowerbeds and that’s the smell I like. I still want to try Jersey but now my hopes are not too high. It is a problem — I think these days fragrance companies don’t want to release real lavender — too sharp for many consumers. So you may have to make do with the flowers! I know. Sometimes it seems like the only thing lavender about some ‘lavender’ products is the color of the packaging. Waaaay back in the ’70s, before I knew what real lavender smells like, I loved Yardly English Lavender soap – the light olive-beige one before they sanitized it and made the white bar. These days, even though I choose lavender when available in the scented products I purchase, my favorite is a lemon-lavender scented candle made by Yankee Candles. Also loved your remark about Jicky, Robin. I also love it but can’t explain why! Maybe just because it’s wonderful, LOL…although I do not necessarily appreciate all the classic Guerlains. I loved that soap, too! Still do, in fact. My mother always kept one in the linen closet, and I still have one old, battered bar which retains a bit of its scent. That was some pungent stuff. I still have a couple bars of it in my linen cupboard, too. I trust your opinion, Robin, and so I now seriously doubt that I’ll even try this. What a shame! The first new Exclusif in years, and they waste it on this. I am disappointed…I had hoped they’d do something bolder than this after Beige, which was nice but pretty low-key. Oh well. Next time. It is not like I am in need of more high end fragrances to covet. I need to keep your last sentence in mind. I had heard some negative buzz, but was ready to like it. Sadly, no – just pleasant, no zing. It may be that I’m not a lavender fragrance woman. I’m certainly not a Jersey gal! I find it pleasant enough early on, but the dry down on me -> not even pleasant. A Taste of Heaven, but everyone already knows that! Delighted to not even want to try this now, not that I could anyway! Love the image. I love lavender in perfume and in any kind of body product or household cleaner, detergent etc. I even add some lavender essential oil to my washing. My favourite lavender perfume is Pour un Homme, Caron. Their Plus Belles Lavandes is also quite good, although that is more of a lavender soliflore. Love Jicky, PdN Maharadjah and Pour Homme, SL Gris Clair, and Goutal Eau de Lavande. I have long been dying to smell Brin de Réglisse. I have yet to sniff my first exclusif, so I think I will pass on this one. Glad to see the Caron get another vote, it deserves it! And do try Brin de Reglisse, it is a weird little scent. I don’t like any of the JCE Hermes scents. That includes Brin de Reglisee. Oh no, don’t hang your head! They are all in the same style, so if you don’t like the style, you’re not probably going to like any of them. I’d be hard pressed to chose between Jicky, Pour Homme and i Profumi di Firenze Spigo Fiorentino Lavanda Azzurra as my favorite lavender. My very favorite lavender product may be the lavender infused gin I made a couple of years back that med the best gin and tonics and Tom Collinses. Oh, that gin sounds fabulous! Like so many others here, lavender is not a favorite note, although I do like Jicky. Every once in a while, I like a spritz of I Profumi di Firenze Terra di Sienna, which has a touch of lavender among a bunch of other slightly unlikely notes partnered together: bergamot and mint; Florentine lavender, cumin, cinnamon, orange blossom and sandalwood, cedar, tonka bean and vanilla. (Yes, it’s a strange and heady brew). My son smells wonderful in Gris Clair. I should also find some Encens et Lavande for him. I can see Gris Clair smelling nice on someone else. Not me though. I’ve never liked lavender, either in its natural herbal state or in perfume or toiletries. It always smells sharp, astringent, and medicinal on me…not soothing in the least! I’m happy to see that another lavender-challenged person has found an exception in iPdF Terra di Siena. I nearly passed on trying it, so convinced was I that it would be the same big miss for me as Jicky, Gris Clair, Brin de Reglisse, Encens et Lavende, Taste of Heaven, and probably a dozen others. Terra di Siena is beautifully composed, and at once fresh, soft, warm, slightly woody, and very comforting. I would encourage all lavender-phobes to give this one a try. Thanks for the Jersey review; I can already tell that I don’t need to sample this one! I can’t tolerate lavender. I don’t know why; it’s not as though lavender ever did anything mean to me. But there it is. Not even my love for Andy Tauer can make me stand two seconds of Reverie au Jardin, and I’m predisposed to loving his work. This fragrance does sound disappointing. I’m not so familiar with lavender in perfume, but I do love Jicky. How interesting that you quoted that article about the process used for Brin de Réglisse. I actually thought of that when I smelled Jersey because it seemed like something was missing—like lavender lite. It’s certainly not harsh like lavender sometimes seems to me in perfume, but I got the oddest minty note for the first ten minutes or so—toothpaste-minty. I assumed it was some aspect of lavender that I just never noticed in quite that way, but it faded pretty quickly. Completely agree about the drydown. Real lavender just doesn’t smell like that. Course, it might not be real lavender either! Reverie au Jardin is my lavender love, and to my nose it retains something harsh and scratchy that reminds me of lavender beds on on a hot day: spiky leaves, dry earth, bees buzzing … There is vanilla in the base but I don’t detect it as an individual note. This is lavender out in the garden still; I like it, and for that reason may not much care for this ‘salon lavender’ of Chanel. Lavender is such a divisive note, as this poll is showing. Some people love it in all forms, some people hate it all forms, some people love it in the garden nowhere else. Some people appreciate it as a flavour but not a scent. It is so widely used not just in perfumery but in cleaning products and aromatherapy, that just about everyone has smelled it in some form. So within that high-risk framework, the folk at Chanel perhaps decided that a classic lavender/vanilla combo was the safest path, cleaned up, of course, to suit modern tastes. Yes, there is Jicky and Pour un Homme, but Chanel will no doubt be expecting that most of its customers will not have heard of those oldies. Thanks for the review and poll Robin. I love reading people’s comments. I spent so much money on Reverie, I shy away from trying the Lutens lavenders, at least for a while. Yes…harsh, scratchy & spiky is just what Chanel was probably afraid of. They went too far in the other direction! Lovely picture! The fragrance sure sounds boring, though! By Kilian A Taste of Heaven is my favorite lavender fragrance (I find it nearly addictive), and I also love Caron Pour Un Homme and Lutens Gris Clair. I have learned to embrace lavender in a big way. Another product I enjoy was a gift, and I don’t remember the brand name. It was a foot cream made with lavender and Dead Sea salts. Very nice-smelling and effective! I love A Taste of Heaven too, although I don’t wear it very often. I received the candle as a gift, though, and it’s lovely–and strong! I’ve had it for several months now, have never even burned it, and it is still scenting an entire (smallish) room. That candle sounds wonderful! I think I need one. Eau Illuminee is a favorite of mine, too. For perfumes, probably Reverie au Jardin is the best lavender. I have come to realize that the lavender leaf kind of makes me sneeze, and I like the flower better. I wanted to love Encens et Lavande (or however you spell it) and it was too brutish. I love Origins Lavender Vanilla body oil, and sometimes a touch of lavender essence (I have a big bottle) is just the thing. A cafe where I work makes lavender lemonade – soooo good!! Tama, brutish is a good way to describe my impression of Encens et Lavande. I really wanted to like it, too, BTW! I have had lavender lemonade, once, and it was great. I should make some. Favourite lavender is Chaos. It’s barely there but gorgeous! Also love A Taste of Heaven I really enjoy the scent of fresh lavender, and the taste of lavender honey ( drizzled on blueberry pancakes especially) but ,aside from the aforementioned, am wary of it in perfume. I think I fear the cheap body-product effect and steer clear when it is made a selling point. I do use the essential oil for bathing when I am stressed and for massaging my daughters when they are restless and find it works very well, particularly on my girls. Maybe I’ll have to investigate all the wonderful suggestions- what are samples for after all?? When I saw the post with the note I thought “hmmm…a high end lavender vanilla Febreeze?” (I used that as bathroom spray in college so the scent is sort of indelibly linked with college bathrooms for me now…) but still held onto hope since it was Chanel. Sad to see that Febreeze actually seems close to the mark on this one. Oh well, there isn’t a Chanel boutique in my entire state so it’s one less sample to ponder buying. Thanks for the review! I think of it as Lysol more than Febreze. Unfortunately. My first grown-up perfume was Jicky (back in 1967-8) and I still love it, although I haven’t worn it for a very long time. Apart from that, I don’t do lavender very much. The Tisserand hand cream is lovely and true, but a bit too strong. Of course, real lavender is wonderful. Btw, I heard Serge Lutens graciously answering some daft questions the other day on French radio. I was trying to remember: when Gris Clair came out, did anyone (article, blog, etc.) mention *why* it was called that? In case they didn’t: it’s called Gris Clair because at the end of summer lavender goes pale grey. If everyone else is aware of this, I apologise: I wasn’t paying enough attention. Thanks for the explanation about Gris Clair. It’s true, it does go grey towards the end of summer. If it survives to do so. Lots of it seems to get harvested before that time. Aha! If I ever knew it, I’d forgotten. I know! Something that actually makes sense. LOL! My Hopes are Still High for this… I remain unaffected by the reviews and still believe this will be as exceptional as I first imagined it being from the beginning. Just like No. 19 Poudre grew on me to become something I have found Mesmerizing, I am sure this will be the same way, as I am a Rabid fan of both Lavender and Vanilla… I shall endeavour to smell this as soon as i possibly can and assure myself of it’s magnificence. Wow, I thought I was shuddering after Gaia’s perfume, but after reading this I dread an overzealous Chanel perfume rep spraying this on me without my consent! My fave lavender scents are Roxana Villa’s Vera, Ajne’s deLavande, and Jicky when I’m in a particular type of mood. Lavender = absolutely NOT calming for me, either. Gives me freakin’ monster headaches. I don’t frequent a spa, but on the rare occasion I do get a massage – maybe twice in four years! – I have had to request no lavender EO. Didn’t like Reverie au Jardin, but Gris Clair nearly killed me, it was so *$&% depressing. Eeyore in a bottle. I like the five minutes’ worth of lavender and bergamot in my sweetie Alahiiiiiiiiiine, but for lavender, that’s about it. … aaaaand another confession: I don’t even like lavender in bloom. (Blush.) It’s an instant mood-downer, not to mention instead headache. I don’t know why. Same here. Plus “Alahiiiiiiine” = great perfumista battle cry! Hi! I know this is not really related, but is Havana Vanille similar to Un Bois Vanille?? Un Bois Vanille smells like a vanilla candle to me and I don’t like it. Will I like Havana Vanille ie Vanille Absolument??? Hi Sniff: I own both, and I don’t find them to be similar, aside from the obvious vanilla connection. The Lutens is very sweet burnt marshmallows and woody vanilla (yum! ), while HV is mellow like it’s been stored in an oaken cast for a few decades. HV is much less sweet, and has the aroma of a humidor, not any burning or smoke (a huge distinction). HV lasts many hours on my skin, but lacks the enthusiastic projection of UBV. Once I had separated the tree huggy associations from lavender and just concentrated on (a) how freaking beautiful a field of lavender looks (and I love the image with this post) and (b) how nuanced the smell of lavender is I began to love Jicky and Caron’s Pour un Homme. From there it was a small step to Kiki extrait (still trying to cope with the passion fruit in the EDP) and by Kilian’s Taste of Heaven. Funnily enough, when I tried Jersey on Saturday I too thought of Brin de Reglisse which is strange because they don’t really smell alike. Actually I thought I might (whispers this next bit) layer them as I find Brin de Reglisse fleeting…….I like Jersey and think it a good match for the name, you know, something easy to wear, but a Chanel Exclusif? Jury’s out…. The only lavender perfume I like is Caron Pour un Homme (not the only Caron perfume I love that features a note I otherwise dislike). My favorite non-perfume lavender product is a lavender- and fennel pollen-flavored goat cheese. I love Essence of Vali’s Sleep elixir– a lavender- marjoram blend specially for bedtime pillow application. It produced not only some of the deepest, most restful sleep I’ve ever had, but great-smelling hair in the morning. Add to that some SL Encens et Lavande and I’m raring to go for the day. Forgot to mention: lavendar sugar. A cup or so of dried lavendar blossoms mixed in w/ a pound of sugar sealed in a jar for a month or so. Lovely taste, lovely scent, terrific with tea. I agree with the Non Blonde: Jersey reminds me of fabric softener. A nice fabric softener, to be sure, but a fabric softener nonetheless. My favorite lavender product is Dr. Hauschka’s Lavender Bath. It’s an oil that I use as a moisturizer before showers and while washing my face. Heavenly! I love lavender, but not always in perfume. L’Occitane makes nice lavender products – body and hand lotions and a cologne spray that I;’ve been using on the sheets lately. I probably enjoy lavender more as a home fragrance than a personal one. I eagerly tried Jersey as soon as I could get my hands on it, and wasn’t awed, but will give it another go, now that my sinuses are more or less behaving. I love the smell of lavender— not so much in cleaning products, but fresh, growing lavender, and dried lavender, are favorite ambient smells. I adore fresh lavender and my grandmother always used dried lavender in her linen closet, but I’ve never really taken to it in fragrance. The exception is Gris Clair which is my “I need to be taken seriously” fragrance. I swear it focuses me in some way. I’m more of an admirer of Chanel scents than a wearer of them, so I’d probably pass on Jersey, being both Chanel and lavender. not a word about antihéros by ELd’O??? Only me adores this lavande? Chiming in *very* late here. I’m testing Jersey for the first time tonight, and I don’t hate it at all. I don’t consider myself a fan of lavender notes, and I only recently started warming up to Jicky. I find Jersey rather pleasant, though it may very well smell like some fabric softener somewhere. What I’m very surprised to find is that to my nose it smells similar to L’Artisan Vanilia (I discovered, to my surprised, that a small subset of Google results DO list lavender in the notes list for that one). I’d happily wear Jersey, and a decant might be nice because it’s nice to wear something new. But I don’t think I’d ever crave a full bottle. I think I have more of a tolerance for clean musks than some do, especially in what might be more expensive formulae (note my recent comment stating my enjoyment of TF Jasmine Musk). Fascinated with this discussion. 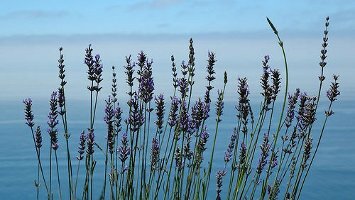 Not smelt Jersey, but must do because I run a company called Jersey Lavender which grows 9 acres of lavender (on the Channel Island of Jersey), distils the oil out and creates a range of toiletry and fragrant products. We ARE the original Jersey Lavender – you can find us on the web. Many comments about not liking lavender in fragrances. I actually think that it’s used far more than we realise particularly in fougere fragrances. Compnies are cautious about using it as a selling point becasue they know the reaction it can provoke. It is to me essentially a fresh, clean note and fundamentally a huge number of us just want to smell fresh and clean. Oh, Coromandel is so not my style — nothing I can say against it because it’s quite well done, but it isn’t the sort of thing I’d wear in any case and then on top of that it is quite STRONG.